Ireland is an island country in the Atlantic Ocean and the third-largest island in Europe. People from all over the world are flocking to Ireland to witness the breathtaking scenery firsthand. Luckily, content creators are bringing their drones along to capture the jagged coastlines, rolling green hills and historic architecture from above. 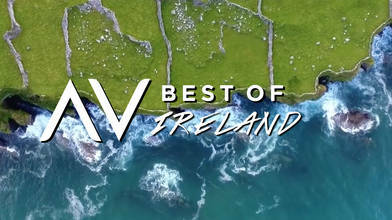 The team at AirVuz.com created this compilation that showcases the best drone videos of the Emerald Isle. Starting with the Cliffs of Moher, Ireland’s number one tourist attraction. Running 14 kilometers long, this create a dramatic border for the ocean. The Fanad Head Lighthouse on the Fanad Peninsula has been voted the most beautiful lighthouse in the world. Located near the water in Kinsale Harbour is the star-shaped Charles Fort. If you’re looking to roadtrip in Ireland consider the Wild Atlantic Way or Ring of Kerry and check out the aerial views. You’ll see thousands of places and attractions, including the Killarney National Park. Other historic places of interest in Ireland include the Rock of Cashel (St. Patrick’s Rock) and Trim Castle where parts of the movie Braveheart were filmed. Major regions in the country to visit are County Donegal, Cork and Dublin. “17 Top-Rated Tourist Attractions in Ireland | PlanetWare.” PlanetWare.com, www.planetware.com/tourist-attractions/ireland-irl.htm. “Fanad Head Lighthouse.” Great Lighthouses of Ireland, www.greatlighthouses.com/lighthouses/fanad-head/. “Ireland Tourist Attractions | Famous Cliffs of Moher Visitor Centre Clare.” Cliffs of Moher Tourist Attraction in Ireland, Things to Do in Ireland | Ireland's Most Visited Natural Attraction, www.cliffsofmoher.ie/. “Ireland.” Wikipedia, Wikimedia Foundation, 21 Jan. 2019, en.wikipedia.org/wiki/Ireland. Lonely Planet. “Cork City Travel | County Cork, Ireland.” Lonely Planet, Lonely Planet, www.lonelyplanet.com/ireland/county-cork/cork-city. If you’re looking to roadtrip in Ireland consider the Wild Atlantic Way or Ring of Kerry and check out the aerial views. You’ll see thousands of places and attractions, including the Killarney National Park. Other historic places of interest in Ireland include the Rock of Cashel (St. Patrick’s Rock) and Trim Castle where parts of the movie Braveheart were filmed. Major regions in the country to visit are County Donegal, Cork and Dublin. SOURCES: “17 Top-Rated Tourist Attractions in Ireland | PlanetWare.” PlanetWare.com, www.planetware.com/tourist-attractions/ireland-irl.htm. “Fanad Head Lighthouse.” Great Lighthouses of Ireland, www.greatlighthouses.com/lighthouses/fanad-head/. “Ireland Tourist Attractions | Famous Cliffs of Moher Visitor Centre Clare.” Cliffs of Moher Tourist Attraction in Ireland, Things to Do in Ireland | Ireland's Most Visited Natural Attraction, www.cliffsofmoher.ie/. “Ireland.” Wikipedia, Wikimedia Foundation, 21 Jan. 2019, en.wikipedia.org/wiki/Ireland. Lonely Planet. “Cork City Travel | County Cork, Ireland.” Lonely Planet, Lonely Planet, www.lonelyplanet.com/ireland/county-cork/cork-city.